HEY YOU!!! PAY ATTENTION!!!! “People who texted while driving had reaction times that were 37.4% slower than when not distracted. Compare this to people drinking and driving who have reaction times 12.5% slower than when sober.” This is the surprising statistics found on the All State Website. In the United States, more than 9 people are killed and more than 1,153 people are injured in accidents that involve a distracted driver. There are three types of distraction: Visual: Looking away from the road; Manual: taking your hands from the wheel; and Cognitive: letting your mind wander from the task of driving. Each of these distractions are dangerous alone. Texting combines all three types of distractions which makes it a vastly more dangerous activity. Before the Distracted Driving laws were put into effect in Orlando, Personal Injury claims due to Cell phone usage was increasing along with that of the Nation. While texting remains one of the biggest culprits of accidents in the U.S. it is far from the only one that is important enough to guard against. Distracted driving is defined by the CDC as, “Distracted driving is driving while doing another activity that takes your attention away from driving.” This was a painful lesson for the 22-year-old hit-and-run driver who crashed into a 17-year-old bicyclist killing him instantly. The driver was trying to pick up an electronic cigarette that had fallen and in those seconds he took his eyes off the road, he ended someone’s life, and changed his own life and that of the bicyclist’s loved ones forever. To protect the lives of our citizens and guard against personal injuries, Orlando drivers are urged to be mindful while driving. 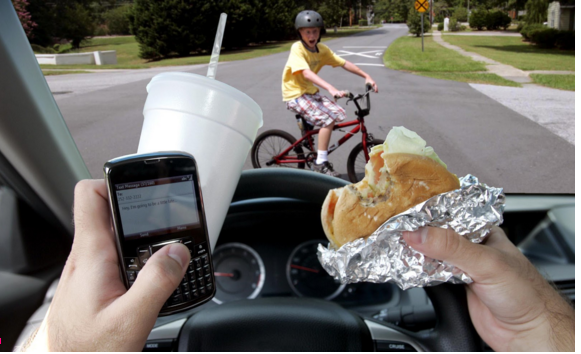 Eating while driving: People who are eating and driving have 44% slower reaction times. Drinking non-alcoholic beverages while driving: People who are drinking non-alcoholic beverages while driving have 22% slower reactions times. Passenger Interactions: 47% of women and 71% of men report being distracted directly by the people in their cars. Pets: Tens of thousands of accidents are believed to be caused by unrestrained pets. If you answered yes to any of the above distractions, please rethink your driving habits. In 2012, more than 421,000 people were injured in motor vehicle accidents caused by a drivers that were distracted; a 9% increase from 2011. If you answered no, you are still at risk unfortunately. In Orlando, personal injuries are inflicted upon careful drivers by distracted drivers every day. If you, or someone you know is the victim of a distracted driver, you are urged to contact the guys at Irsmedic.com to find out how they can help protect your rights, recover fair compensation for your injuries and lost wages, and fight for loss of life compensation for immediate family members.